Earlier this week, we made note of an interview Nintendo Dream conducted this summer with the developers of Fire Emblem Echoes: Shadows of Valentia. In the same interview, Nintendo and Intelligent Systems talked about the “Battle of Revolution” April Fools’ Day joke that took place earlier this year. It was kind of surprising to see Nintendo go all out with fabricating a game like that. A site was set up, and various images and details were created just for the joke. Basically, Battle of Revolution was imagined as a NES-style game set in the late Edo period of Japan. Nintendo’s Hitoshi Yamagami and Kenta Nakanishi as well as Intelligent Systems’ Toshiyuki Kusakihara and Masahiro Higuchi discussed Battle of Revolution and how it came to be. It’s an interesting read, with the excerpt posted below. You can also read the full interview on Kantopia. *TN: The Battle of Sekigahara was a decisive battle in Japanese history that paved the way to the rise of the Tokugawa Shogunate in the year 1600. Yamagami: We had to do something like that! (Laughs). 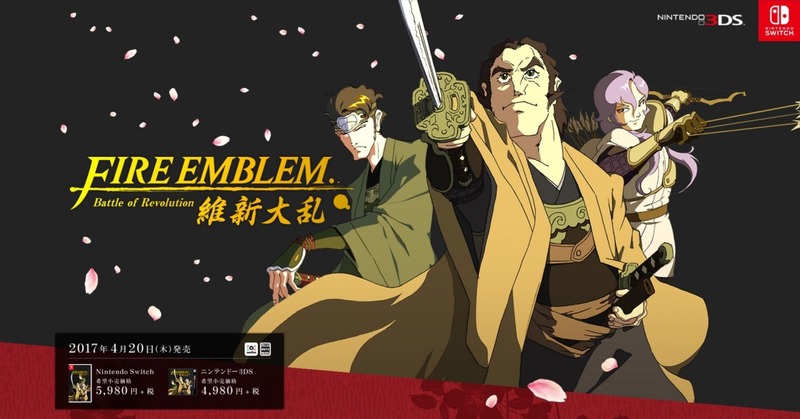 But it turned out people in the company had already thought about things like “Let’s make it follow an Edo Period theme.” We had Ozawa (Touru) , who did illustrations for past FE games, begin to draw up various artworks for us. So I had to rethink my Sekigahara suggestion, and consulted the others. “What about the [Meiji] Revolutionary War?” They liked that plan and so we went with it. So the next challenge was thinking about how we could make it seem legitimate. Q: And so how did you go about that? Yamagami: I began with writing a serious and somber preface with the theme of “a return to the origin” on the draft for the home page. Then I ended up writing the rest of the sentences based around that theme myself. Q: That was all really written by you, Mr. Yamagami? Yamagami: Yeah (Laughs). Though I wanted to write a simple piece at first, the serious tension steadily increased. I started to think about things like how the weapon triangle would work, and it was really fun. I figured if anyone read this preface, they probably wouldn’t think it was a lie. Nakanishi: All that just for writing a lie. Yamagami: After that the last thing I was asked for was a signature – but I lacked one. I quickly asked the graphic designers to think up a signature for me and then got to practicing writing it. Nakanishi: We actually had to think it up for him. Q: It was still before Echoes’ release, but people recognized Leon and others in the pic. Yamagami: The homepage staff assigned them different kanji* for us. *TN: Chinese characters used in Japanese. Yamagami: The development staff was made up of only those attached to Nintendo at the time, but if we didn’t get any IS names on there then it wouldn’t look legitimate. So we got some IS staff entered there for us (Laughs). The person in charge of public relations was hesitant to get IS rolled up in Nintendo’s April Fools’ plans, but eventually came around. Q: In other words, you had to go through great lengths to talk IS into it? Higuchi: Yes. But we were in high spirits about it too. If we were to do it, I requested to put original staff [from back then] on board. Kusakihara: Osawa drew up the illustrations for us. A lot of work was done for us from the shadows. Yamagami: It was interesting since it was talked about in the news a lot more than we thought it would be.